Bernard Simon (1858-1948), who emigrated to Baltimore and is the ancestor of the largest group of Levin's descendants in America. The Gibmeyer, Schütte, and Zarnitz families of Baltimore, Maryland, which intermarried into the Simon family. The Barcant family of Trinidad and Tobago, beginning with Jean Pierre Augustin Barcant, who came to Trinidad from France in the early 1800s. 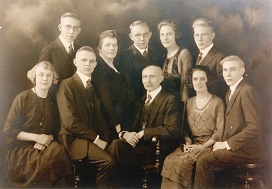 The Krogh family of Trinidad, which is part of a more extensive Krogh family originating in Denmark. This family may be viewed starting with Robert Joseph Krogh (1904-1980), a noted physician in San Fernando, Trinidad. His wife was Germaine Marie d'Abadie, a member of an extensive French Creole family in Trinidad that intermarried with the de Verteuil family. The genealogy of the d'Abadie family is also part of this website, as is the genealogy of the de Verteuil family (see this link for a more extensive chart of the Trinidad branch of the de Verteuils). The descendants of William Hurd (died 1799), who first appears in public records in 1776 in Caroline County, Maryland, near what is Greensboro, Maryland, today. His descendants farmed on both sides of the Delaware/Maryland state line. The descendants of George Hurd (ca. 1767-after 1840), who first appears in the records of Kent County, Delaware around 1800. This Hurd family appears to have resided mostly in Delaware. The descendants of Thomas Hurd (ca. 1826-1867) and Rachel Foreacres, who resided in Kent County, Delaware. This Thomas Hurd may have been a grandson of George Hurd, but the connection is speculative at this point. The descendants of Daniel Hurd (ca. 1822-after 1880) and his wife Miriam. The descendants of Robert B. Hurd (1856-1918) and Lucy Snyder. This Hurd family originated in northeastern Pennsylvania and moved to Delaware in the 1800s. The Clark family of Kent County, Delaware, and Caroline County, Maryland, beginning with John Clark (1787-1870). Several Dolan families in Termonamongan Parish, in the vicinity of Killeter in western County Tyrone, Northern Ireland. Termonamongan Parish has a rich and conflicted history, which I have written about separately here. Dolans have likely lived in this area for centuries (for example, the Dolan name is incorporated into a Townland name in western Tyrone), but due to the lack of written vital records before the 1860s, it is not clear exactly how the various Dolan family groupings in the area relate to one another. There are four major family groupings with descendants still in County Tyrone today. They are shown below. Thirteen other Dolan families or family groupings that lived in the area can be found by going to this supplementary page. You can click on the family/townland link below for a summary chart or on individual names below for a more detailed look at that person's family. The Dolans of Seegronan Townland, located south-southwest of Killeter town. The documentary evidence for this family begins with John Dolan (1805-1883) and his brothers William Dolan (1807-1896), George Dolan (1809-1882), and Patrick Dolan (died about 1862). Family oral history takes this family back an additional two generations to the grandfather of John Dolan, known as "Auld Shawn" Dolan. This Dolan family, via marriage, is related to a number of other families on this website. Most of the children of John Dolan emigrated to Philadelphia, Pennsylvania; one daughter married Francis McCanney and moved to the vicinity of Drumquin--her descendants can be found in County Tyrone, England, Scotland, Canada, and the United States. The Dolans of Killeter Townland, located west of Killeter town, descended from Francis Dolan (1789-1872). Descendants of this family still live in and around Killeter today. A family descended from James Dolan (ca. 1835-1885) appears to be related to this set of Dolans, as well. The Dolans of Crilly's Hill Townland, in which the bulk of Killeter town is located, descended from Patrick Dolan (1805-1864), a spirit merchant in Killeter town in the mid-1800s along with his son Charles. This family moved out of the Killeter area in 1877 to Scotland, and settled predominantly in the Glasgow area. After the death of Charles Dolan in 1907, his widow returned to County Tyrone to live with her brother and a daughter returned to work in Killeter and married into the McSorley family. The Dolans of Ardarver Townland, located northwest of Killeter, beginning with James Dolan (ca. 1831-1903). Descendants of this family also live in townlands to the north of Killeter today. DNA testing indicates a potential common ancestor with the Seegronan Dolans back in the 1700s. As mentioned above, information on 13 other Dolan families who lived in this area in the late 1800s and early 1900s can be found here. Any further information on how these various families might interrelate would be welcome. The Carr family of County Donegal, beginning with Thomas Carr (ca. 1776-1866) of Drumgorman near Mountcharles and including numerous descendants of his son Simon Carr (1812-1888) of Pettigo, Templecarn Parish. DNA testing shows that another Donegal Carr family, starting with Lawrence Carr, is related through a common ancestor in the 1700s. The McGillin family of Philadelphia associated with McGillin's Olde Ale House on Drury Street, beginning with William "Pa" McGillin (1827-1901), born in the Plumbridge District of County Tyrone, Northern Ireland. A related Philadelphia McGillin family is descended from Bernard McGillin of County Tyrone, perhaps a brother of William McGillin. A third McGillin family is descended from Thomas McGillin. If you reached this page from the McGillin Family History webpage, you can return there by clicking here. If you would like to submit information for inclusion in this website, please use this Family Worksheet, or the "Worksheet" tab on any given individual or family page, to send me new or additional data on members of the above families. There is also a "Submit Photo/Doc" tab that you can use to upload photographs or other documents to attach to a particular person's record. Thank you! Many people have assisted me over the years, or have published research from which I was able to work, in creating the database of information available on this website. I am deeply grateful for their work and assistance. A listing of their names can be found here. Permission to use photographs and illustrations from the copyrighted works of Anthony de Verteuil, C.S.Sp., kindly provided by the author. Images and data from documents from the Departmental Archives of Meurthe-et-Moselle, France, reproduced with permission in accordance with the Departmental policies regarding the non-commercial use of information. Images and data from documents from the Departmental Archives of Charente, France, reproduced under the Etalab Open License 2.0. Legal Notice for Use of UK Crown Copyright Information: Because this site uses genealogical and historical information derived from sources that are administered by the Government of the United Kingdom, it contains public sector information licensed under the Open Government License 3.0. No endorsement of this site by the UK Government or its subsidiary entities is implied by the use of this License. Bernard Simon of Baltimore and his family, circa 1920-1922.